Steve Clarke in happier times. My last post (here) concerned the almost rhythmical nature of being the Premier leagues "crisis club" and the fact that being manager of the crisis club was likely to be a job with very few long term prospects. At the time of writing it appeared to be Norwich's Chris Hughton who had the dubious privilege of being that man. I did point out that a couple of good results could place another manager in the line of fire and Martin Jol at Fulham being the obvious candidate. As things turned out Jol was indeed sacked shortly after losing to West Ham in what was deemed a must win game. 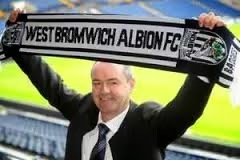 What I did not anticipate was the next managerial sacking would happen at the Hawthorns and in truth despite a poor run of form Steve Clarke was fired without ever really becoming the designated Manager under pressure at the crisis club. He was facing a must win game against Hull but the board decided that enough was enough following a pretty dire performance at Cardiff and showed Clarke the door. In my earlier post I suggested that whoever was going to be next manager fired would not be last as the scrap to avoid relegation hotted up as the season progressed. I also suggested that not all of the sackings would be justified but in a situation when a club's owners are under pressure to do something and unable to go into the transfer market to freshen things up boards tend to axe the manager. In Steve Clarke's case was the sacking justified ? During his first season he got off to a blistering start which faded quite badly but none the less took the Baggies to their highest league finish in years by finishing 8th. Unfortunately for Clarke he rather lost his way and in spite of a few highlights this season has witnessed a sharp decline in his team's performance to the point he was operating below expectations. In his departing statement issued through the LMA Clarke suggested that expectations at the Hawthorns had become unrealistically inflated in part because of his own performance the previous season. This might hold true for some fans but the board at the club is realistic almost to a fault. The bottom line is simple survival in the Premier League is the number one expectation as it is most clubs in the league. To achieve this a manager needs to see his team average a minimum of 1 point a game failure to do that over a sustained period of time and most managers are in jeopardy. The same applies to teams with loftier ambitions of Champions League qualification but here the average is 2 points. Coincidentally across all those teams that are currently averaging less than a point a match in the Premier League only one West Ham have not changed their manager. In Steve Clarke's case he had dropped below the point a game average for the season but even that might not have been critical particularity as his team was only one win away from getting him back across the right side of the line. Aside from the slump in the team's form and a feeling of drift that was starting to envelop the club what did for Clarke more than anything else he or people close to him had briefed journalists to put pressure on the board on a few issues concerning transfers and Clarke's own future. Some may argue that it is the modern game and media savvy coaches use briefings to fight their own internal battles over contracts and resources but this is something that is frowned upon at the Hawthorns. Chairman Peace took over in the wake of a power struggle between the then manager Gary Megson and Chairman Paul Thompson which in effect Thompson lost. Peace learnt the lesson well and the management dog does not wag the ownership tail at West Brom and any manager who plays silly buggers in the press had better deliver the goods or else. Ultimately when a team is under performing and Albion have been for sometime the Head Coach will be given time to put things right but how long rather depends on the goodwill that he has with the club's owners if there is mitigating circumstances and an understanding fan base. In Clarke's case there was little by the way of mitigation he has a big squad and was backed as best as the club could in the most recent transfer window and while the fans were still generally behind him there was a growing sense of unease, however some of his earlier actions had eroded the critical goodwill of his employers. Unfortunately we will never know whether it was the right decision or not. All football appointments are subject post-hoc rationalisation along the lines of Albion do well for the remainder of the season it is the right move if they do badly and it will be condemned as over hasty. The appointment of Mauricio Pochettino at the Southampton is the blueprint, roundly condemned by most pundits at the time but now hailed as a masterstroke as Southampton now sit happily in the top half of the Division. I will stick my neck out and say the decision was the right one the team was on the slide and not to act would be wrong however a lot now hinges on the next appointment and getting the right man in will be critical.